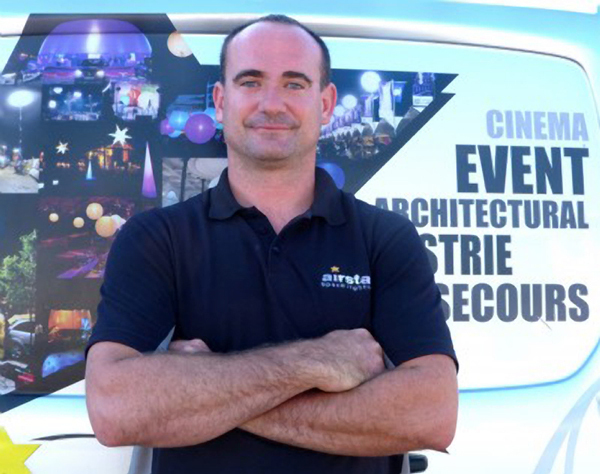 Florent Gatard is Event Sales Director for the French market at Airstar, the world leader and inventor of the lighting balloon technology. Established in 1994, Airstar is specialised in the design, manufacturing and distribution of inflatable structures and lighting balloons for the event and staging industry. An innovation source at the crossroads of lighting, design and technology, Airstar is active in 40 countries through 12 subsidiaries and a network of independent distributors. In this article, Gatard shares some important considerations to make before lighting up a festival site. Once the site has been chosen, the line-up secured, and partners and sponsors signed, every festival organiser has to eventually confront the question: How do I light up my festival? Let’s forget about stage lighting for a minute and concentrate on the festival site lighting. It’s the component that no organiser wants to hear about because they have better things to deal with, and no punter really cares about unless it undermines their festival experience. This lighting question is actually more complex than it looks, because it’s not just about lighting up a random field that cows will graze on the rest of the year, it is about security around and inside the site, it is about managing a crowd, filtering the entrance, signalling the nearest loos and cash points, facilitating interventions for first-aid teams, creating a nice atmosphere, and maybe most importantly, it’s about making the festivalgoer’s experience the best possible so they want to come back next year. The last thing festivalgoers want is a dazzling light. This annihilates the whole point of having a light in the first place! Traditional halogen light posts decked out with a power generator are not only plain ugly, they are also extremely unpleasant on the eyes, and people will tend to stay away from them. Festivalgoers already have to fork out a lump sum of money to attend in the first place without being assaulted by a blinding light pole. On the other hand, light is critical to get a festivalgoer to feel safe, but also to point them to the nearest facilities: Where are the loos? Where can I recharge my wristband to get more drinks? Where’s that trapezoidal stage everyone keeps talking about? Where can I get help for my friend who had one too many? All these questions can be easily answered with a simple lighting balloon standing metres above the ground. For those who are primarily coming to listen to their favourite bands or have fun with their friends, signage is also actually quite important. For example, Airstar’s cubic lighting balloons are becoming increasingly popular with festivals because they are easily recognisable from a distance, and they can be labelled on each side with easily recognisable pictograms (men, women, disabled). Without even paying attention to lighting, a festivalgoer will judge the overall quality of a festival by the way the festival was lit, because it will have a direct impact on the festival experience. When organising a festival, there are a number of things that need to be taken into consideration when it comes to finding the right lighting solutions: price, quality, legal requirements, norms, electricity consumption, power, safety, going direct or through a service provider, onsite technical aid, etc. The choice of your festival lighting will not be the same whether you are part of the smaller festivals that last for a couple of days or if you are organising a mammoth festival that will stretch over a week. The former will tend to source their lighting equipment directly from the manufacturer or service provider, and we often see technical guys coming to our office to get a quick training session before they go away with some of our lighting solutions in the boot. And that’s absolutely fine as long as the solution is simple enough to put up and dismantle without the need for a technical guy. On the other hand, if your festival attracts tens or hundreds of thousands of festivalgoers, you may want to make sure that there’s a team onsite who can deal with the whole lighting aspect of the site, so that you can direct your attention to the many other issues you are lucky enough to have. For big festivals we typically dispatch our own team, which brings the lighting solutions, puts them up, maintains and services them if required during the festival, then dismantles them and ships them back home. Job done. Usually, a festival organiser who didn’t hear about lights during a festival is a happy festival organiser. Choosing the right lighting solution can also have a huge impact on your bill. Our lighting balloons are design to use less power, and because they light up on a 360 degrees axis, at least half the number of balloons is required to light up an area compared with traditional lighting. They are also much lighter than conventional lighting solutions, which is equally important when rigged to trusses and temporary structures. This is all without mentioning the favour you will do to Mother Nature by having a festival that is working on its carbon footprint – a real differentiator and a really good practice to be proud of. Airstar provides different light source technologies and balloon designs to answer the complex needs of a festival. Take the ticket control area for example. Not only do you need to get people to naturally migrate towards the entrance, but also, you need to facilitate the job of security to check that the entry tickets are genuine and the content of the bags and backpacks are approximately legal. Having an efficient lighting can help you seriously streamline the whole process, not only for your staff but also for the festivalgoers. With all the money they splash out, sponsors are also usually keen to get their brand out there on highly visible surfaces. We recently equipped a festival with two-metre wide balloons labelled with a leading bank logo to point out an area for festivalgoers to recharge their wristband with money. Simple. Lighting balloons kill two birds with one stone: you get the light and an effective signage! Festival organisers understand the importance of keeping the sponsors and the VIPs happy, and over the last few years, we have witnessed growing efforts for amazing backstage and VIP areas. This summer, a leading French festival asked us to recreate an artistic animation that we have done for the Lyon Festival of Lights, and scatter imposing lightbulbs from different sizes and shapes in the VIP area, which impressed both the artists and the sponsor guests. An effective lighting can generate more money than you think. We have more and more festivals asking us to label our balloons with branding or useful signage (food, bar, cash, toilets, etc.) as well as balloons of various shapes and sizes. We have all sorts of inflatable lighting shapes available and this can really be a differentiator for a festival: spheres, ovals, diamonds, stars, fish shapes, tubes, arches, cones, and more. Some of our balloons even float on water! All this helps to guide festivalgoers where they need to be, and stay longer. Now that’s an interesting proposition for bars and food trucks who can get more revenue in one night. Finally, and maybe most importantly, is the security of your patrons. An effective and evenly distributed lighting will mean less antisocial behaviour, fewer accidents, a better crowd flow and easier access for rescue teams. Before Airstar even started lighting festivals from the inside, it was the lighting solution of choice for technical roads for security and rescue teams as well as for the surrounding roads to minimise the risk of road accidents. So whatever you do, think about your lighting solution before you light that fuse.